Soup maker Kettle Cuisine’s top executives say they will put 175 employees to work in their plant now under construction on the Lynnway early next year. The Chelsea manufacturer’s $22 million investment is already visible just past 330 Lynnway. Vice President of Operations Nigel McGinn said the Lynn plant will open in January and Kettle Cuisine will move its Chelsea operation in phases to the Lynnway. The company makes 150 kinds of soups, as well as sauces and oatmeal. McGinn said 60 percent of Kettle Cuisine’s production volume is sold to the food services industry for use in restaurants with the remaining 40 percent sold to Trader Joe’s, Crosby’s, Whole Foods and other retailers that sell cup-size soup servings. 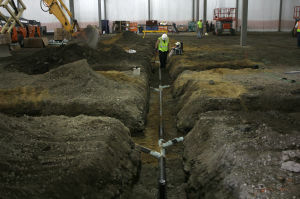 Workmen install drains in what will be the production area of the new Kettle Cuisine Company located next to the Clock Tower building in Lynn. “We ship locally and all the way to the West Coast,” said McGinn. The company is building a 72,000 square foot, two-story corporate headquarters and production building next to 130,000 square feet of commercially refrigerated production space owned by Lynnway businessman Arthur Papathanasi. Papathanasi will sublease 69,000 square feet in the refrigerated facility from Kettle Cuisine for use in dairy company Garelick Farms’ production process and Kettle Cuisine will use the remainder of the refrigerated space. “We will be one of the most advanced food facilities in Massachusetts,” McGinn said. Once completed, the Lynnway building will feature a two-story entrance foyer with reception area and corporate offices on the second floor. Employee work preparation and relaxation areas will be on the first floor along with a “development kitchen” where Kettle Cuisine employees will perfect and experiment with new recipes. Fresh vegetables, seafood and other ingredients that go into the company’s soup will arrive at the Lynnway plant once it opens and be stored for processing. Workers will prepare vegetables, meats, proteins and other ingredients in separate factory areas to ensure Kettle Cuisine soup meets standards required for allergy and gluten-free recipes. Even company vending machines will be peanut-free. Some of the company’s soups simmer in 400-gallon vats. “We assemble the recipes just like you do at home, but on a lot bigger scale,” he said. McGinn said the production process is divided between low risk and high care work depending on sterilization requirements for the type of soup being made. Workers wear special clothing to ensure sanitary work conditions and “positive air flow” will be maintained throughout the plant to ensure potentially-contaminated outside air does not enter production areas. He said a process involving high temperature heating followed by a chilly cool down ensures the shelf life required for Kettle Cuisine soups. After the company outgrew its Chelsea plant, Kettle Cuisine executives decided to move to Lynn because of the opportunity to build a plant right next to refrigerated production space. “The city has been very welcoming to us, and we’re reciprocating by trying to hire Lynn employees,” said Chief Financial Officer Trent Shute. He said the company currently counts 20 Lynn residents among its Chelsea workforce. “Once we’re here, we are expecting a preponderance of the workforce to come from here,” Shute said. McGinn said company workers enjoy health care, including dental care, and 401K benefits as well as bonuses. Lynn Woods is the site of the company summer party, and McGinn said Kettle Cuisine hopes to work with North Shore Community College on cuisine programs oriented to the firm’s production process. Economic Development and Industrial Corporation Director James Cowdell said the improvements Kettle Cuisine and its employees bring to Lynn will stretch well beyond adding a new building on the Lynnway. “They could have gone anywhere but they came here,” he said.